The choices for countertops can seem overwhelming for some people and for others is as easy as 1,2,3 , but the truth is that there’s never been a better time to be in the market for a new counter. Gone are the days you only have granite and marble. Today, you can choose from hundreds of colors, patterns and textures, in materials ranging from natural stone and acrylic sheets to quartz composites and stained concrete. 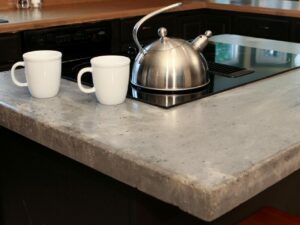 Here’s a detailed look at the six most popular countertop materials that we at Simplinteriors school of interior design will recommend you use: natural stone, solid surfaces, plastic laminate, ceramic tile, wood and concrete. 1.Natural stone: This is the most common natural stonesused to make countertops granite, soapstone and slate. Here’s a brief look at each material. Granite, once found only in expensive, high-end kitchens, is more commonplace today and is by far the most popular natural stone countertop material. Granite counters are sold primarily through local fabricators, but they’re also available at many home centers and kitchen showrooms. Granite comes in a wide array of colors, ranging from vibrant blues and variegated browns, to midnight black, deep red and mottled white. It’s cut into long, thick slabs that require few–if any–seams. Most fabricators routinely make one-piece granite counters up to 10 ft long. After cutting and polishing, the granite is treated with an impregnating sealer that makes the countertop stain resistant. This treatment usually lasts 10 to 15 years, but be sure to use a stone cleaner–not an abrasive cleanser–for everyday cleaning. Soapstone and slate both come in far fewer colors than granite. Soapstone is usually dark greenish-black, although lighter green-gray slabs are also common. Slate is an extremely dense stone that comes in five subtle colors: green, red, gray, purple and black. Slightly less common on the other hand, is nonporous and virtually maintenance free. Slate is relatively soft, but scratches can bebuffed out with steel wool. Slate has a soft, matte sheen, but you can create a wet look by rubbing the slate with lemon oil. At Simplinteriors school of interior design and Simplinteriors Furniture Company,Solid-surfacing materials, such as CORIAN and AVONITE are highly recommended they are made of 100% acrylic, 100% polyester, or a combination of acrylic and poly. They’re highly resistant to stains and scratches, and completely renewable and repairable. Scratches and burns can be sanded out; deep gouges can be filled. Seams are fused together to create undetectable joints. And the material comes in literally hundreds of colors and patterns, many of which resemble natural stone. Solid-surface sinks are also available. They are on the high side in cost. Contractors dismiss solid-surfacing materials as being nothing more than imitation stone, which is a bit unfair. Solid-surface counters have been around for nearly 40 years and have performed admirably in thousands of kitchens. A unique characteristic of solid-surfacing material is that the design possibilities are virtually limitless. From intricate inlays and custom backsplashes, to elegant edge treatments and colorful pinstriping, if you can dream it there’s a good chance the fabricator can create it. The main differences between engineered stone and traditional solid surfacing materials are that engineered stone is much harder and has a depth, clarity and radiance not found in other solid surfaces. Quartz composites cost slightly more than traditional solid surfaces, but both materials are comparable to granite. Plastic laminate–which is often referred to by the tradename FORMICA -is a durable, hard-wearing material that can survive many years in the toughest kitchens. Considering that plastic laminate is made primarily of Craft paper impregnated with resins, it’s a surprisingly resilient choice. Plastic laminate is available in hundreds of colors and dozens of patterns, and in various textures. However, only those with a matte or fine matte finish should be used for countertops. Be aware, too, that there are two basic types of laminates: 1/16-in.-thick general-purpose, and 1/32-in. vertical grade. Only general-purpose laminate is suitable for countertops; vertical grade is for backsplashes, cabinet doors and drawer faces. Plastic laminate comes in sheets ranging from 2 x 4 ft to 4 x 8 ft. Interior designers and know where to buy ready-to-install post-formed laminate counters, which feature seamless construction. Again, prices vary widely. If you hire Simplinteriors interior designer, or any cabinetmaker to custom-build a counter, prices will range from N20, 000 to more than N100, 000 per sqft, depending upon the laminate chosen, complexity of the edge treatment and size of the backsplash. Ceramic tile is often applied to a plywood substrate or directly over existing plastic laminate countertops. However, to ensure a rock-solid, long-lasting installation, Simplinteriors prefers using 3/4-in.-thick plywood topped with 1/2-in.-thick cement backerboard. It’s difficult to estimate the cost of a tile countertop since much depends on the tile chosen and complexity of the installation. Simple solid-color tiles cost as little as N2, 500 per sqft, A pro installation will cost between N9, 000 and N15, 000 per sqft, plus the cost of the tile. To learn more about Interior design come to Simplinteriors school of Interior design & Entrepreneurship.